Spacecraft and launchers used for interplanetary missions and mission to the Lagrangian points may be inserted into orbits that can come back to the Earth or impact other planets. The probability of these events to happen should be estimated also for interplanetary CubeSats, during their mission design, to ensure they are compliant with planetary protection requirements. These requirements are in place to limit the risk of contamination of celestial bodies due to space missions and they prescribe a maximum allowed impact probability that should be verified over a time window of 50-100 years, considering possible inaccuracies of the launcher or failures of the propulsion system. A new tool, called SNAPPshot (Suite for the Numerical Analysis of Planetary Protection), was developed by the University of Southampton under a study for the European Space Agency, to verify the compliance with planetary protection requirements for different missions. The tool is based on a Monte Carlo (MC) approach to study the dispersion of the initial conditions of launchers or spacecraft. For each scenario, the launcher injection dispersion, the uncertainty in the spacecraft physical parameters, or potential spacecraft failures may be modelled. Each initial condition is propagated through a high accuracy propagator. The suite includes several Runge-Kutta propagators, providing also the possibility of dense output and the inclusion of user-provided events in the propagation (e.g. the propagation can be stopped if an impact is registered). Different options in the ephemeris routines (including the NASA SPICE toolkit) are available, which were validated against the data on the JPL Horizon system. Once a trajectory is propagated, it is analysed with the b-plane representation to identify impacts and resonances with celestial bodies. Fly-bys of different bodies and subsequent close encounters can be handled. The tool can identify the most critical close encounter, which will be used for the statistics generated from the MC analysis. The number of required MC runs to validate the requirements with a given confidence level is automatically estimated Wilson confidence intervals. If impacts are detected, the number of MC runs is automatically incremented. Some results obtained with SNAPPShot will be presented, showing its applicability to different missions and its flexibility in analysing multiple mission scenarios. 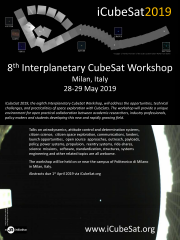 The computational resources for each analysis and some visualisations of the results will be also discussed, together with its future application to the robust design of interplanetary trajectories for CubeSats.